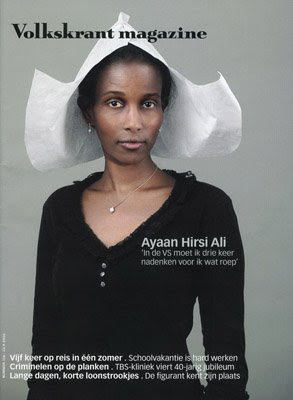 Former far-Right Dutch MP Ayaan Hirsi Ali spoke tonight at a forum organised by the (right-of-) Centre for Independent Studies on the topic of Enlightenment Values. During question time, I reminded Ayaan Hirsi Ali of an interview I had with her when she was last in Sydney for the Sydney Writers' Festival. sophisticated version of creationism) in American schools. Hirsi Ali's answer wasn't exactly diplomatic. People who teach creationism in schools should be imprisoned, she said. I asked Hirsi Ali whether she still held to that view and what she regards should be the limits of free speech. At first Hirsi Ali denied ever saying this. I then put to her the fact that I had the recording of the interview, she claimed I had quoted her out of context. I understand that her real name is Ayaan Hirsi Magaan. She used the name "Hirsi Ali" on her application to gain asylum. She was later forced to confess that the application contained incorrect and false information. I propose she now be given a new name - Ayaan Hirsi Hilali. It's identical to her assumed name, only with three extra letters. Like her namesake, Sheik Tajeddine Hilali, Ms Hirsi Hilali has the habit of claiming her embarrassing remarks really involved her being quoted out of context. Some may wonder what Hirsi Hilali's views are on the limits to free speech. From my recollection, she said that speech should be free within the confines of the law. She cited a recent decision of the US Supreme Court which apparently stated that it was OK for a defendant to call for Jews to be expelled to Israel and blacks to be sent back to Africa. Apparently the judge in that case said that the defendant had the right to say this because there were no blacks or Jews within earshot. So as long as you follow the law, you are free to say what you like. The law is supreme, even if ridiculous or oppressive. Pakistan's former military dictator, General Muhammad Zia-ul-Haq, used similar reasoning. He was asked when he would restore democracy. He said: "We already have democracy. We have the rule of law. I have established the rule of law, and so my government is democratic". Dr Frank Furedi, who spoke before Hirsi Hilali, ended his talk by suggesting that in Europe there are no free speech heroes. Both the left and the right only support free speech when it suits them. If Ms Hirsi Hilali's views are any indication, Furedi's assessment might be extended across the Atlantic. (Anyone wishing to receive the unedited copy of my interview with Ayaan Hirsi Ali is welcome to e-mail me at irfsol@yahoo.com.au).